Running very late so I’m delighted to see a long line of cars waiting – no riders, though. My ride is a super-huge SUV – a Buick Enclave. 8 people can ride in this beast. The driver is a young woman, to my surprise, and another like her is in the back seat. I expected the driver of this giant vehicle to be a big overweight guy with KNBR sports radio blaring away. This diminutive lady, with KCBS on the radio, has a welcoming greeting and smile as I climb in. Once we settle in and traffic is steady, I ask the driver how she feels about the car pool toll coming up in July. She’s not happy and says she’s going to look at her commute costs to see if the ferry might be a better way to go. She’s already paying parking where she works and if the car pool isn’t going to help out with commuting costs, she may give it up. I point out that most riders I’ve talked to are agreeable to contributing $1 to their rides. We talk, with some amusement, about how this might be collected – perhaps some drivers will place a little collection bucket strategically between the seats, or they may just have their hand out when the riders get in. We share concern for the future of the casual carpool. A historical note: today is the 109th birthday of Frank Woodruff Buckles, the last living veteran of WWI. 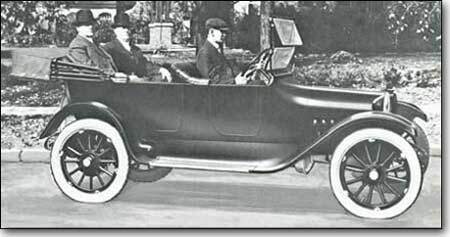 When Frank was born in 1901, the only car being manufactured was the Oldsmobile Curved Dash. It did so well that within 2 years Oldsmobile was mass producing 20,000 cars a year. Also of historical and perhaps odd note: 2 brothers got the contract to produce transmissions for those early Oldsmobiles. Their names were John and Horace Dodge, and in 1914 they produced their own car. The Dodge Boys in 1914 in their first car.